While spending time on the family farm in Nakhon Phanom I was really impressed with how self sufficient they really are. I knew they grew most of their own food and caught their own fish, but I was surprised at just how much the farm gives them. The various fruit and nut trees give way to dense copses of bamboo which they use for everything from weaving material to make sticky rice containers to using larger sections of bamboo for jugs and tools. One day I noticed this tree with large green pods that I had never seen before and before I could ask, Grandma, who is 86 years old, started towards me with a large bamboo pole. For a second I thought she was going to whack me with it but then I realized she was aiming for the large pods that the tree bore. 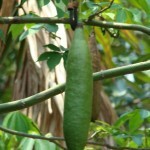 The tree it turns out was a Kopak tree which is a member of the Bombacaceae (bombax family) that grows in Asia and Indonesia. 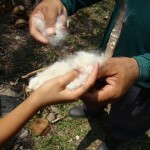 The pods contain a thick fiber filled with pea sized seeds. This fiber is some serious stuff. It’s moisture resistant, quick drying, buoyant and very resilient. 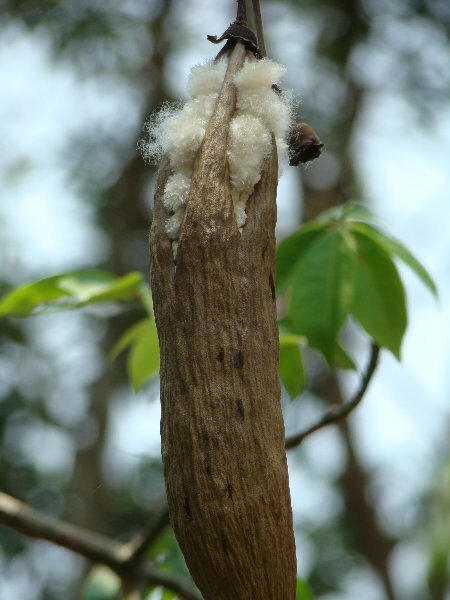 The fiber from the pods of the Kopak tree is used for stuffing everything from pillows and mattresses to upholstery and life jackets on boats. 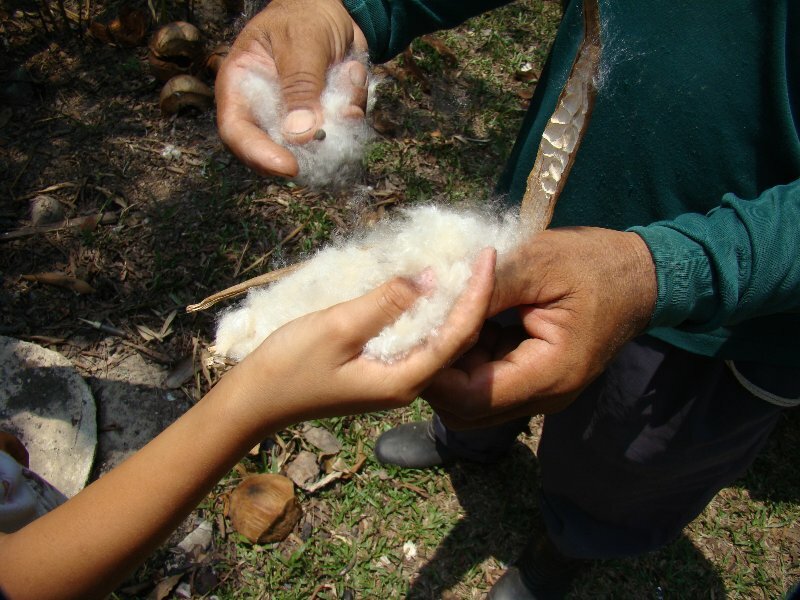 The fiber is also occasionally used for insulation and a cotton substitute during surgery. 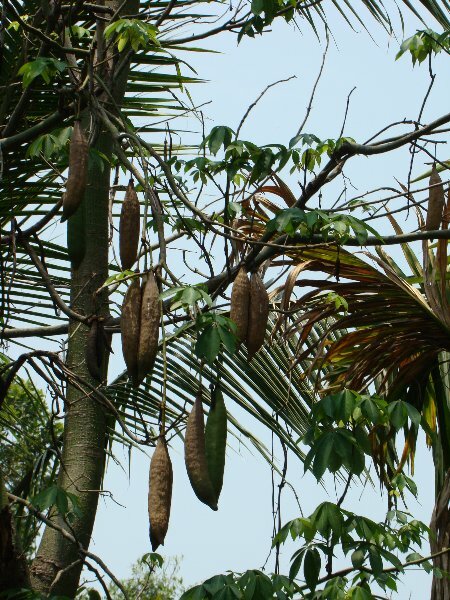 The seeds contained in the pod contain about 25% fatty oils that are used to make soap and edible oils and the residue left over from the process is used for fertilizer and livestock fodder. The family helped grandma knock down a bag full of Kopak pods and then showed me how they are processed. 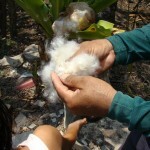 You break open the pod and pull the thick fiber out , being careful to remove the seeds as you go. After the fiber is out it is then laid out in the sun to dry. once dry it is shaken out to remove dust and any left over seeds…and then you stuff your intended target. Unless there is an immediate need the pods are left to turn brown and burst open on the tree before they will collect them. In this case they grabbed all the brown pods and a lot of green ones as well. It looks like grandma will have a very comfortable sleep tonight! 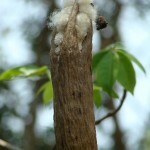 There is only one downside to the fiber of the Kopak tree…it is highly flammable! I don’t think grandma cared about that so much as she did about fluffing up her pillows. We call the Kopak tree, Kekabu in my part of the world. 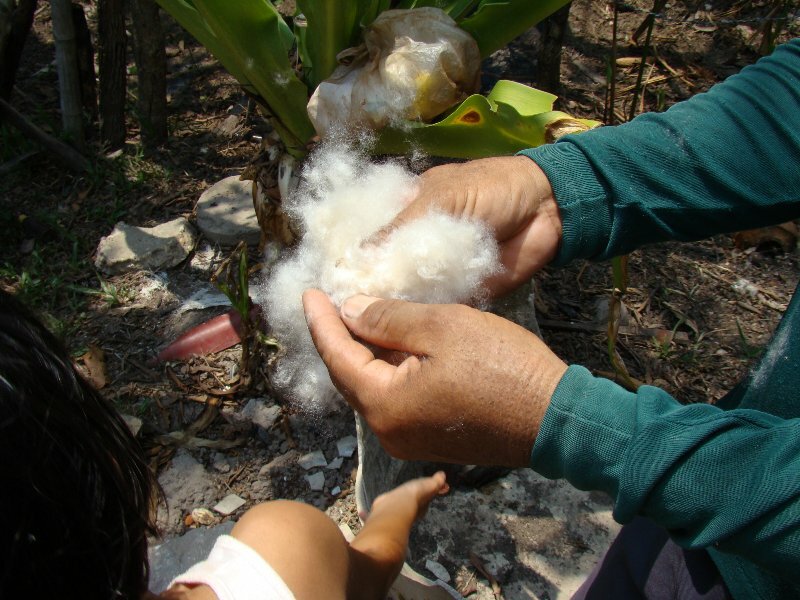 We also use the fiber to make pillows, but the down side of using kopak/kekabu as a pillow stuffing is that they will get hard over time. So after a while, it is not a nice fluffy pillow anymore. Talen, I envy you being able to experience this side of Thailand. I don’t know anything about the Kopak tree but I expect there is a lot about the farming side of Thailand that would interest me. Do you know of any books on the subject? Catherine, I don’t know of any books on the subject but I have a lot to write about it and plan on adding a lot about rural life to the blog. The family thought I was crazy always taking pictures on the farm but there was so much to remember and that I wanted to write on that I didn’t want to forget it. Well, I for one will be looking forward to your experiences with rural life in Thailand. I love gardening and so much here is still a mystery to me. The Kopak tree was a mystery to me until I viewed this post. I like the way the pods hang down from the branches and with their multi purpose usage then perhaps money really does grow on trees. If one of the pods fell on your head you’d need the cotton wool substitute from quite a few of them.